Maersk has sent a container vessel on an Arctic Sea route from Vladivostok to St Petersburg. Specifically, it has sent a 3,600 TEU ‘ice class’ vessel through the Bering Strait and along the northern Siberian coast to St Petersburg in the Baltic. Maersk made a statement to the Financial Times on Tuesday that “the trial passage will enable us to explore the operational feasibility of container shipping through the Northern Sea Route and to collect data” but went on to say “currently, we do not see the Northern Sea Route as a commercial alternative to our existing network, which is defined by our customers’ demand, trading patterns and population centres”. In fact, the Northern Route has been attracting pilot services for some time. For example, COSCO indicated that it was interested in the route in 2016 and sent several ships on what appear to have been non-scheduled services. However, by far the most important potential development was by NYK and Mitsui OSK Lines. They have been competing in developing LNG tanker and terminal services at Yamal and other northern Russia gas terminals in order to access Siberian gas for the Japanese market. Probing missions by these shipping companies on the Northern Route have been going on for several years, however it is unclear if either NYK or Mitsui OSK Lines is moving ahead with the idea. There are several issues with the ‘Northern Route’. Firstly, its viability is based on the assumption that the prevalence of ice will diminish, for at present sailing is difficult even during the summer. A more fundamental problem is the shortage of destinations. Whilst the route from Northern Asia to Northern Europe may be shorter than going through the Suez Canal, the Suez route passes a large number of major ports serving large markets in the Mediterranean, Middle East, Indian Ocean and South East Asia as well as connecting Europe with North Asia. 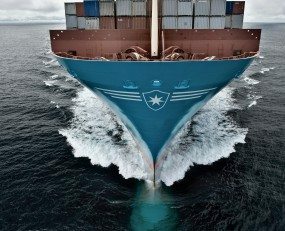 So, for the moment, as Maersk said to the Financial Times, the Northern route is not really a major “commercial alternative” to the existing shipping network. However, it might be observed that if Vladivostok were able to develop a stronger rail link into Western China and Mongolia it could access the increasing Asia-Europe overland volumes. That really would be an important development.